Our gallery was founded in 1990, the year of German reunification, and since then we have created several thousand paintings which now hang in private homes, museums, churches, barracks, companies, hospitals and doctors' surgeries. The quality of our work is so high that our customers often recommend us to their friends and families. Our high standard of quality and reasonable prices mean that our customer base throughout the whole of Europe and abroad is constantly growing. We particularly focus on artistic reproductions of ancestral paintings. And of course, we will work with you find the perfect frame for your ancestral paintings. We will be able to provide you with specialist advice about designing and framing your painting. 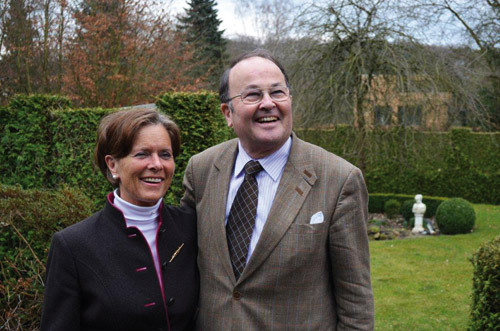 Marion and Edgar von Hobe in their garden in Reinbek.